It is a standard result that quantum mechanics does not allow for superluminal communication, which would seem to directly imply that the answer to this question is no. After all, Bell's result tells us about correlations, and we know that correlation does not necessarily imply causation. Now let us consider the quantum case. The full probability distribution has to be written in the more general form $p(a,b,x,y)$, and whenever a form of Bell's inequalities is violated by this distribution, then we know that we cannot factorize it with the help of an additional variable as in (2). However, we can still assume that the measurement setups are chosen independently, so that we can still write $$p(x,y)=p(x)p(y),$$ althought we cannot write $p(a,b,x)=p(a,x)p(b)$ or $p(a,b,y)=p(b,y)p(a)$. My question is then precisely about these last statements: does the fact that $p(a,b,x)$ cannot be factorized as $p(a,x)p(b)$ imply that there is a causal relation between the two measurement outcomes? It kind of does, but in a useless way. The question is essentially equivalent to the following simplified version of it: suppose a probability distribution $p(a,b)$ cannot be factorized as $p(a)p(b)$. Does this imply that $A$ "causes" $B$? The answer is: not really. The problem is that, from a purely probabilistic point of view, there are no "causal relations", only correlations. Whenever there are correlations between variables, their marginals can be written so that one variable "looks caused" by the other, but this statement does not have much value. Indeed, we can always write $p(a)=\sum_b p(a|b)p(b)$, which makes $A$ being "caused" by $B$, because $p(a|b)$ is defined as $p(a|b)\equiv p(a,b)/p(b)$, and the marginal $p(a)$ by $p(a)\equiv\sum_b p(a,b)$. While true, this is not a very useful observation. It is meaningful to talk about causation in a context in which one can actually exploit such correlation. 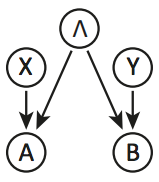 For example, if one can choose to have the variable $B$ assume the value $b$, then it is meaningful to talk about the conditional probabilities $p(a|b)$. Notably, this is exactly the kind of thing that we cannot do in quantum mechanics: the measurement results are probabilistic, and therefore cannot be controlled. A hidden variable theory means simply a deterministic theory. What this means that given a deterministic theory of QM where cause propagates locally, and this means physically and hence at or less than the speed of light, then it won't match all the predictions of standard QM. Alternatively, if it turns out this deterministic theory does match the predictions, then cause will propagate faster than light speed. Generally the second option is ruled out on the basis of relativity and this leaves the first option - that QM is not deterministic. What this means about entangled systems being non-local is left open. However, its shown through the no communication theorem of QI that no actual effective information can be signalled at faster than light speeds. So QM remains local in this second, weaker sense of locality. What is really important to understand before formulating any answers is the exact meaning of the words that enters into the context of Bell's theorem and in particular locality, realism and causality. Locality and causality are linked together in what is defined as "relativistic local causality". Then it is unfortunate that realism - please let me quote wikipedia here - "is now somewhat different from what it was in discussions in the 1930s. It is more precisely called counterfactual definiteness". I'm adding the previous sentence about the meaning of realism because the final answer to the OP question - which I want to rephrase as: does causality hold or not? - depends on which of the two - realism or locality - one chooses to abandon after Bell's theorem. For example R. D. Gill suggests that we should "relinquish not locality, but realism": in that case we would somehow arrive to the conclusion of the OP's answer, i.e. that "the question of causality is ill-posed in this context". On the other hand, I would prefer the opposite choice, arriving to the opposite conclusion, that causality is meaningful and QM (or De Broglie–Bohm or any other theory which satisfies Bell's inequality) has to be non-local theory (important note, non-local in the sense of Bell's theorem, but of course we all agree about the signal locality or no-signaling principle or no-communication theorem). Finally, a minor note should be added about the fact that the experimental verification of the inequality is subject to the closure of all the possible loopholes (free will, fair sampling and so on). does the fact that $p(a,b,x)$ cannot be factorized as $p(a,x)p(b)$ imply that there is a causal relation between the two measurement outcomes? From a mathematical point of view that means that QM violates "outcome independence" . Together with the fact that $a$ and $b$ can be spacelike separated, this implies that QM violates local causality. This is not to be confused neither with the non-deterministic character of the theory nor with the possibility to exploit this feature to send FTL signals. Signal locality is indeed expressed by a different mathematical constraint: $p(a|x, y) = p(a|x)$ or equivalently $p(b|x, y) = p(b|y)$. Nonetheless - whatever interpretation one chooses to explain the so-called collapse of the wave function - this kind of non-locality remains. For example Bohmian mechanics satisfies outcome Independence and fails to satisfy setting Independence. Back to QM, Bell's inequalities follow from the algebra of Hamilton's quaternions (more technically Bell quantum bound is obeyed for the case when four commutators vanish and Bell's inequality can be given meaning in the formalism of C*-algebras ). Interestingly there is also a geometric interpretation of the hidden variables as the global phase curled up under the Hopf-fibration between the unit spinor and the Bloch vector - which is again (without dwelling into the proof check of any alternative theory) a non-local topological mapping. My question is then precisely about these last statements: does the fact that p(a,b,x) cannot be factorized as p(a,x)p(b) imply that there is a causal relation between the two measurement outcomes? No it doesn't imply any causal relation between the measurement outcomes. Bell's theorem sez that any hidden variable theory must be non-local to match the predictions of quantum mechanics. Those hidden variables are descriptors of a system that have a single measurable value. Quantum mechanics is not a hidden variable theory, so the Bell inequalities don't imply that quantum mechanics is non-local. Rather, each system exists in multiple versions and those versions are matched up in the appropriate way when the measurement results from the entangled systems interact. For example, if particle 1 is entangled with particle 2, and particle 1 is measured at a point p1 spacelike separated from the measurement of particle 2 at point p2, then all of the possible outcomes happen for each measurement happen. When these outcomes are compared at some third point p3 after being coveyed there by local means, the matching takes place, but before that comparison they are not matched. This matching is done using quantum information that each system holds that can't be extracted by measurements on that system alone and so doesn't suffer decoherence. For a detailed quantum mechanical account of how the Bell correlations happen see David Deutsch, Patrick Hayden, 'Information Flow in Entangled Quantum Systems', Proc. R. Soc. Lond. A 456(1999):1759-1774. available at http://arxiv.org/abs/quant-ph/9906007. And also David Deutsch, 'Vindication of quantum locality', Proc. R. Soc. A 468(2012), 531-544. available at http://arxiv.org/abs/1109.6223. This account is given using what is commonly called the "many worlds interpretation of quantum mechanics", which is just quantum mechanics taken literally as a description of how the world works. For reasons that are not well explained, this is controversial. There other "interpretations", some of which are alternative physical theories like the spontaneous collapse theory or the pilot wave theory. These are alternatives to quantum mechanics, not interpretations and they are in general non-local because they say that EPR type experiments have single outcomes. Other "interpretations" such as the Copenhagen or statistical interpretations don't make clear statements about what exists in reality and so no account can be given of what is happening in reality under those theories. Not the answer you're looking for? Browse other questions tagged quantum-mechanics quantum-information causality bells-inequality or ask your own question. Quantum non-locality with commuting measurements? Why does classical light (arbitrary mixtures of coherent states) always result in super-Poissonian statistics?